One of the things I crave when coming to NYC is pizza. In particular, Brooklyn pizza. When I was last in Brooklyn with my father we went to Di Fara and Totonno’s. 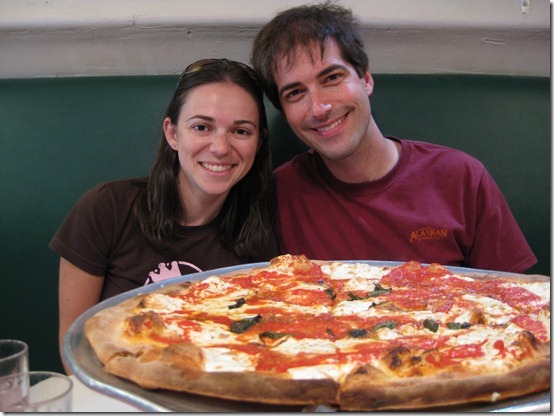 Both were fantastic, though we didn’t get to try out the third famous heavyweight of Brooklyn – Patsy Grimaldi’s. Today we walked across the Brooklyn Bridge to correct that omission. 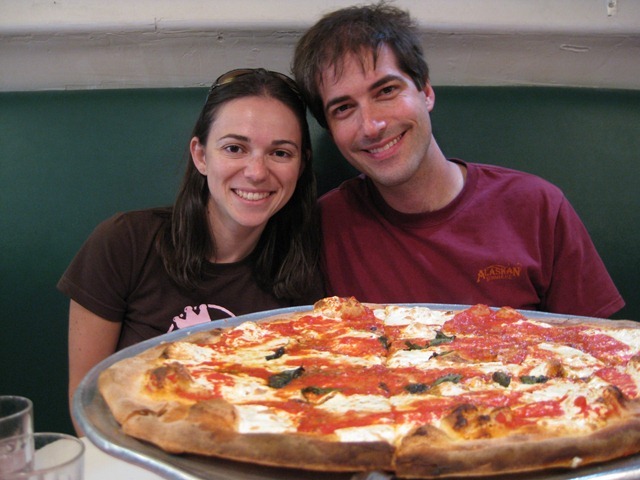 Grimaldi’s flagship location is located in the DUMBO area of Brooklyn, just on the other side of the Manhattan and Brooklyn Bridges. Walking down Fulton St, you will see the line outside Grimaldi’s from a few blocks away. On line, the owner will ask the size of your party and then fill tables to maximize people, which often means that 4-person parties get a table long before the couples. Either way, the line moves pretty quickly. And once you’re inside, the pizza you get is more than worth the wait. All of Grimaldi’s pizza are cooked in a 1200 degree coal-fired brick oven, which turns around a cheese pizza in about 3 minutes. The crust is crispy, chewy, and a little smoky; absolutely perfect. Don’t be deceived by the sparse looking mozzarella cheese. The mildly sweet tomato sauce hides the fact that underneath is a full layer of deliciously flavorful mozzarella that comes from free range cows and is worlds better than the flavorless mozzarella you get from your local supermarket. Side-note: It looks like Grimaldi’s has opened a number of franchises in the Southwest. I’m always a little skeptical about quality control in moves like this, so I will personally be restricting my Grimaldi’s visits to the Brooklyn location. This entry was posted in Food on September 4, 2009 by kenny.